House Call Doctors Can Help You Lead A Healthier Life. What Can you Do in 40- Seconds? In 40-seconds you can call Resurgia’s House Call Doctors to begin a regimen of in-home medical care that can help you take preventative steps for heart disease and strokes. Together with regular exercise and a well-balanced diet, accessible medical care can help you live a healthier life. Make the call. 40 seconds is all it takes. Call Resurgia Health Solutions to see how our house call doctors can work with you to secure a longer, healthier life. Call us now at 1-84House-Doc to start a conversation. One voice is powerful. Thousands are even stronger. You’re the Cure – the American Heart Association/American Stroke Association’s grassroots network – has been doing just that. It’s a community of fathers and mothers, neighbors and friends, researchers and caregivers, passionate about an America that’s free of heart disease and stroke. Each day, they work together to advocate for heart-healthy and stroke-smart communities through legislative policies in our cities, states and across the country, and they hope you will join them. Visit You’reTheCure.Org to learn more. 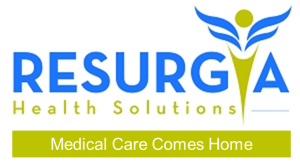 Atlanta based, Resurgia Health Solutions is a medical practice focused on treating patients at home with House Call Doctors…its medical care when and where patients need it. Our visiting house call doctors are able to treat patients in the comfort of their own homes with a suite of mobile medical services that align closely to the services provided in a typical doctor’s office, yet with more hands-on and in-depth approach that is very differentiated from the traditional doctor’s office visit – our typical visits is 45 to 90 minutes. House Call Doctors in Atlanta Georgia. Nice. Resurgia’s house call doctors deliver a high-touch approach to mobile medicine (not TeleMedicine) that is refreshingly innovative and highly effective in getting to better patient outcomes and lower overall health care costs. Call 1-84House-Doc or email info@resurgia.com to learn more about Resurgia House Calls Medical Practice and schedule an appointment with our house call doctors.